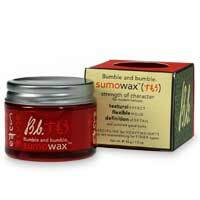 Bumble and Bumble SUMOWAX,a traditional, hard wax for modern cuts. Use it on any type of hair or length to define texture, get strong, yet flexible hold and add shine. Plenty of discipline for heavyweights but not overwhelming for finer types. A unique blend of waxes gives hold and great sheen.